When you ask most U.S. consumers where their favorite new world Pinot Noir is grown, you have a good chance of hearing “Russian River Valley” or “Sonoma Coast” (or “Sonoma County”) or maybe “Willamette Valley” (or “Oregon”). After that, you may hear “Carneros” or “Central Coast” or “Santa Lucia Highlands” before anyone says “Mendocino County” or “Anderson Valley”. But Mendocino County’s Anderson Valley is the source for a lot of very good and better Pinot Noir that is increasingly on more Pinot lovers’ radar screens. Anderson Valley Pinot producers of note include Copain, Husch, Donum, Expression 39°, and Golden Eye and Migration (from Duckhorn). More and more, Anderson valley is becoming a figurative destination for value-seeking Pinot Noir lovers. Why “figurative” and not “literal”? And why “value-seeking”? Both for much the same reason: Because Anderson valley is north of Sonoma County in somewhat remote Mendocino County, the vineyards are another hour north of Santa Rosa. With so much to see and do in Sonoma County, relatively few visitors make the rewarding trip north to check out the wineries and vineyards of Anderson Valley. (The same is true of Lake County north of Napa County.) And because Anderson Valley is less traveled and lesser known, the land cost less so the grapes grown on it can be sold for less and used to make wines that sell for (relatively) lower prices. While Handley Cellars owner/winemaker Milla Handley is no newcomer (Handley was bonded as a winery in 1982), she is also not yet a household name except maybe in the most discerning Pinot-loving houses. If you drink this wine, you will know and remember her name. 100% Pinot Noir, mostly organic (from a broad mix of clones and known massal selections) grown in Handley’s Estate Vineyard (52.5%), Ferrington Vineyard (13.7%), Helluva (13%), RSM (which is Milla Handley’s home – 10.4%), and Romani (10.4%). Grapes are de-stemmed with 1/3 whole-berry fruit fermented in open tops with three daily punchdowns. Malo-lactic fermentation and aging 10 months in all French oak barrels (25% new). Medium-red color with well formed legs; dry, medium light-bodied with freshly balanced acidity and medium phenolics. Fresh, mixed-red, mostly cherry fruit with fine cola and spice notes and a bit of warm earth. Integrated and complete. 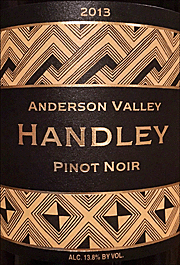 Delicious classic Anderson Valley Pinot at a great price. BearScore: 91.